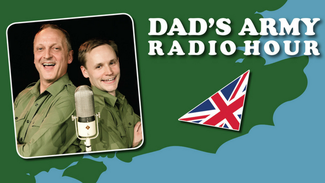 Following a successful three-week run in London's West End, Dad's Army Radio Hour (based on the classic BBC sitcom by Jimmy Perry and David Croft) is embarking on a major, nation-wide tour and we are delighted that they are including Saddleworth as part of the run. Two actors play 25 characters in this brilliant staging of classic radio scripts based on favourite episodes from the original TV series. Celebrating 50 years of Perry and Croft's quintessential sitcom, which won the Best One-Liner accolade in a poll of comedians, with the immortal words "Don't tell him, Pike". Double Fringe First Award winner David Benson (star of Think No Evil Of Us: My Life With Kenneth Williams and Boris: World King) and Jack Lane (Wisdom Of A Fool) present a selection of classic radio episodes featuring favourite lines, cherished characters and great feats of vocal impersonation! This acclaimed production is directed by Olivier Award nominee Owen Davies.